Anne George's novels offer a delightful mix of gentle comedy and compelling mystery. Murder Runs in the Family finds two feisty 60-something sisters doing a little amateur sleuthing into the death of a visiting genealogist. Mary Alice has spared no expense for her daughter's wedding. Two days after the glittering affair, Mary Alice and Patricia Anne are spending a fascinating lunch listening to the groom's cousin explain the 'dog-eat-dog" world of professional genealogy. Minutes later they are shocked to learn that the genteel woman they were just speaking with has fallen from a courthouse window. Determined to get to the bottom of things, Patricia Anne soon finds herself enmeshed in a world where proud old families are willing to kill to keep their ancestor's dirty laundry from being aired. 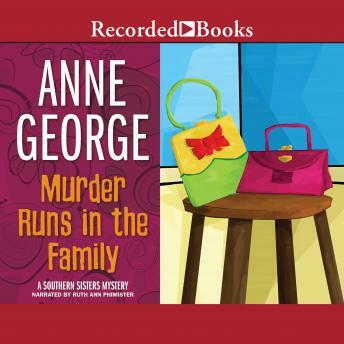 Full of good clean fun, Anne George's novels deliver nonstop suspense tempered with light-hearted laughs and a cast of quirky characters. Ruth Ann Phimister's rollicking narration perfectly captures both the love of family and iron will of these two Southern ladies.